Warnings: warnings for consent issues related to accidental voyeurism and for nightmares. Summary: Four dreams Geno accidentally shared. Summary: Part 1 of the Mutant AU Series. Summary: Part 2 of the Mutant AU Series. People can say what they like about Geno—that he's too thuggish, too Russian, too mutant for NHL ice—it doesn't matter. He's got Sid's back, and the whole league knows it. Well, the whole league except for maybe Sid himself. So I just rewatched the 'Parks and Recreation' episode 'Hunting Trip' [S2E10] and for some reason my brain decided to replace April and Andy with Bogo and Troubs. "You know," said Zach, "if I gave you a hickey it would totally make Scheifs jealous." "I don't know- It wou- I think that's pretty gross- Seems kinda weird." "What's weird about one friend sucking on another friend's neck?" "...You know, when you put it that way it doesn't sound that weird at all." Recorded as a 2016 holiday present for pyrexic. Merry Christmas, hon, and here's hoping we can hang out some more in 2017! My gratitude to @Mistress_shiny and @Sabrina_il_ for the consult on the cover art! Summary: Alex is a simple man with simple needs: finish his chem degree on time, pay his rent, and keep his job as a barista despite a chronic inability to make drinkable coffee and the ever increasing certainty the cafe he works at is a front for the mob. Notes and acknowledgements: Thank you to lostlenore for permission to record this fic. Hugs as always to Paraka and Jinjurly for hosting. Summary: Tanner is supposed to be kneeling for Richie. Notes and acknowledgements: Thanks to rsadelle for permission to record her fic, and to Paraka and Jinjurly for hosting! Phil laughs. "I'm staying at Sid's." 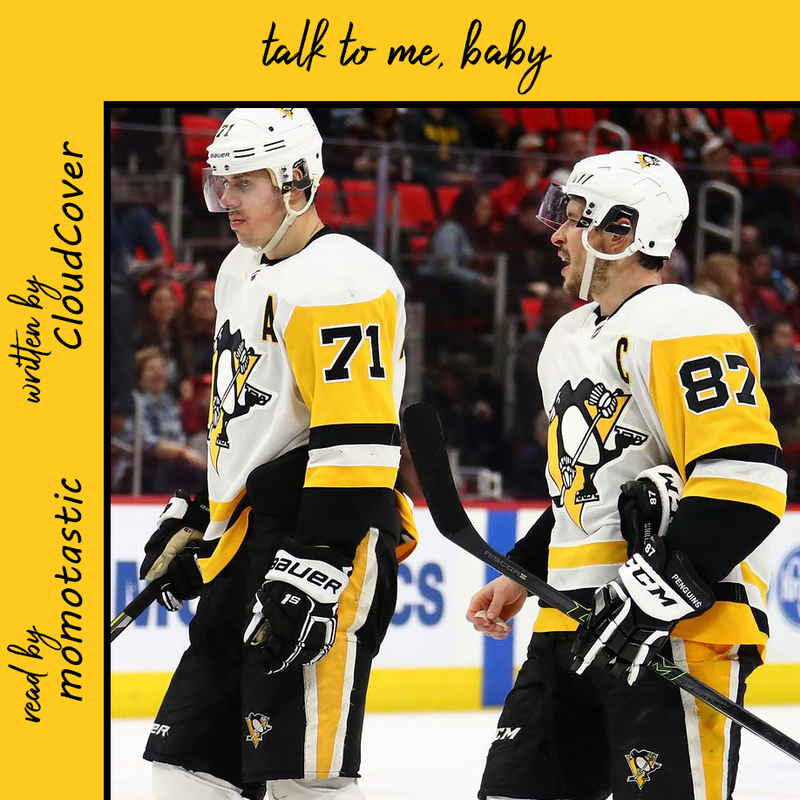 Amanda is about to protest — there's no way she is going to stay in a house with Sidney Crosby, no matter how temporary a visit it might be — but Phil continues, "He's still in Canada, but he said I could stay until I found my own place." "Did he say you could have guests?" "He didn't say I couldn't," Phil hedges, "but I'll clear it with him if you want me to." "Okay, do that," Amanda says. "I'll send you the details once I've booked my flight." Thanks to theladyscribe for podfic permission, and to Paraka and Jinjurly for hosting! In which Sid is a goose, Geno is a leopard, and both of them are clueless. Notes and acknowledgements: This fic has been anonymous for ten months now, so we're going ahead and posting. If the original author wishes to request that we take it down, please email us at hananobira@gmail.com and we will do so immediately. Otherwise, thank you, Anon, for the cute little fic! We had a lot of fun with it. Eternal gratitude, as always, to Paraka and Jinjurly and the Audiofic Archive archivists! “I don’t think I’m gonna make it to midnight,” Wilso mumbles. He’s got his hands under Mike’s shirt, fingers stroking Mike’s stomach lightly. Thanks to armillarysphere for having blanket permission, and as always to Jinjurly and Paraka.